Are you making plans for getting married in lovely Hot Springs, Arkansas? Lucinda and Robert will be happy to assist you with finding the perfect venue for your wedding ceremony or renewal of vows. Answers to your questions about the marriage license are answered below…give us a call if you are ready to schedule a time and place and we’ll discuss how our ministry can help you make this a memorable day. You can get your marriage license at any County Clerk’s office in Arkansas. A Marriage License can be only be used in Arkansas but can be used in any Arkansas county, regardless of which county you get them in. Bride and Groom must be 18 years of age. Under 18 requires consent of both sets of parents. If over 21 years of age, Bride and Groom only need to present a valid drivers license. If under 21 years of age, Bride and Groom must also have a birth certificate. Marriage license must be returned to the County Clerk’s office within 60 days – used or unused. This information is provided as a convenience and we assume no responsibility for errors, changes, hours of operation, holiday schedule, omissions or for services provided. It is your responsibility to verify with the State of issuance for regulations and requirements regarding marriage license. Please contact the court house for requirements, fees, hours, etc. Follow Hwy 7 North towards the downtown area. You will stay on Hwy 7 (AKA Central Avenue) through The Hwy 7/Hwy 70 intersection. Go to the next traffic light which is Market Street. Turn left on Market Street and go one block to Ouachita. 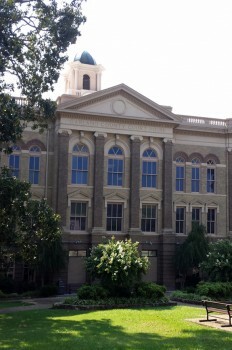 Turn left on Ouachita and The Garland County Courthouse is a few blocks up on the left hand side at 501 Ouachita.